Dubai: Artists have started transforming huge marble slabs into works of art as part of the inaugural Sculpture Dubai event. Sculptors from 13 Arab countries are each working on six-tonne slabs of stone as they race to unveil their creations by March 8 at the grounds of the event organiser, Dubai’s Cultural and Scientific Association (CSA). Held in collaboration with Mattar Gallery in Dubai, the event seeks to inspire local talent. Aspiring artists and art students will be able to witness the visiting experts in action and also learn from them during hands-on workshops. It is believed the finished sculptures will be installed in Dubai. Emirati artist Mattar Bin Lahej — after whom the Mattar Gallery is named — did not disclose what shape his marble slab will take, but was hoping it would be counted among “one of the unique pieces”. “You’ve got to plan art like engineers plan buildings — what part will go where, when, and how. We’re doing this [Sculpture Dubai] for art in the UAE. You have to create something, make the future,” Bin Lahej told Gulf News. 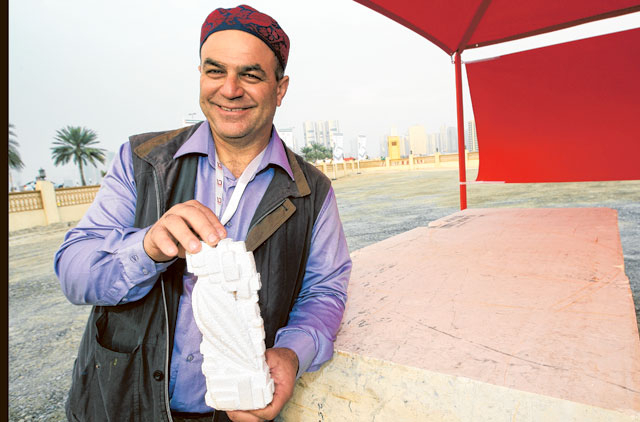 Palestinian artist Ahmad Kanan, 47, said he would create a sculpture showing two villages, with one supported by a wing. “Like most works of art, each person will see their own meaning in it,” he said. It is expected the artists will clock in about eight or nine hours daily at the CSA grounds in Mamzar, from around 10am to approximately 6pm.